I received my Phase 1 (P1) longboard skateboard on Friday. 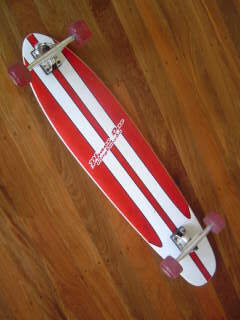 I bought it from eskatestuff on eBay for $130 plus $20 postage. I have taken the P1 longboard for a couple of rides with my trusty dog alongside, covering about 12 km so far. Initial impressions of the Phase 1 longboard are that it is well made. The deck has plenty of flex carrying my 85 kg weight, but doesn’t appear in any danger of breaking. The wheels spin freely on the bearings, and all parts seem to fit together and work well. The silk screen red and white print underneath the deck is semi-translucent, meaning that you can see the deck’s wood grain through the red paint. I personally like the understated graphics. Like my Bling Old School skateboard, the P1 came plastic wrapped with the trucks bolted on through the plastic. I will therefore need to find half an hour to pull the trucks off, remove the remaining plastic shreds and put the lot back together again. Not a major issue, just an inconvenience. Seat of the pants — or sole of the foot, if you prefer — feel of the Phase 1 longboard is that it is slower than my Bling Old School skateboard. The P1 certainly rides smoother with the bigger wheels and flexi deck. Because the wheel base is longer, the thunk-thunks as you go over pavement cracks are also further apart, giving the sound that the P1 is slower. I am not sure that it really is slower though. I will need to do a comparison review sometime. The cushions in the trucks seem to be quite soft, allowing sharp turns. It does mean that your foot on the board needs to be centrally placed when pushing though, otherwise the longboard easily steers off course. However, the general setup of the P1 encourages you to carve down streets. I thought that the looser steering setup may have compromised downhill stability, but bombing down my usual hills, the board is quite stable. The Phase 1 longboard is quite high. I guess you would expect that riding on 7 cm wheels with the trucks on risers. What it does mean, is that when pushing, you certainly have to have quite a high work rate to keep the speed up. It is a bit like doing a stair climb with one leg while the other foot pushes! A good cardio workout! The P1 does not come with wheel arches. However, wheel bite has not been an issue for me so far. The Phase 1 is noticeably heavier than a standard size skateboard, which is what you would expect given the extra length, larger trucks and bigger wheels. But the extra weight does mean that the longboard requires a bigger shove to accelerate it when pushing. 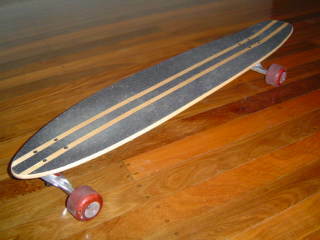 Overall, initial impressions are that the Phase 1 longboard is well made and rides well. I am looking forward to spending some more time on it. This entry was posted in Skateboards and tagged Review, Skateboard on 28 October 2007 by Rex. This was extremely hard to stumbleupon there was a lot of crummy entries on this I am excited I finally stumbledupon a post worthy of being under this search. Good stuff bookmarking cause I have a slight feeling several posts on here will benefit other queries I have faster then looking google. Great review man. Always good to read reviews before buying a skateboard, helps out a lot. Thanks for sharing this.